The IBM 1311 Disk Storage Drive provided storage for 2 million characters. Developers of the 1311 engineered twice the recording density of the IBM 1301 Disk Storage Unit by reducing the space between the head and the disk by about a factor of two. The 1311 used the IBM Disk Pack (later designated the IBM 1316 ), an interchangeable package containing six 14-inch-diameter disks in a four-inch stack, weighing 10 pounds (seen above in the man's left hand). Each disk surface contained 20 pie-shaped regions. Sectors were segments of track lying within a region, and were the smallest addressable unit, with a capacity of 100 characters. Average access time to any sector was 250 milliseconds, which could be reduced to 150 milliseconds with an optional direct-seek feature. The disks were rotated at 1500 rpm, tracks (50 to the inch) were recorded at up to 1025 bits per inch, and the usual head-to-surface spacing was 125 microinches. The ten recording surfaces provided in normal usage a storage capacity of 2 million characters, the equivalent of approximately 25,000 punched cards or a fifth of a reel of magnetic tape. 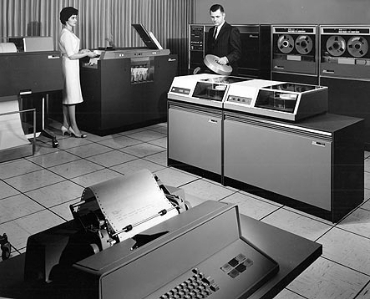 The first host mainframes for the 1311 were the IBM 1401 Data Processing System , 1440 Data Processing System , 1620 Data Processing System and 1710 Control System. By offering some of the advantages of both tapes and disks at a relatively low rental, the IBM 1311 met a need for versatile storage and became a very influential product. In addition, some analysts believe that the removable disk pack not only led to a new phase of disk storage but signaled the passing of the punched card era.